Madness, The Specials, The Beat, Bad Manners and more! Fiveska play Two Tone Ska in clubs, pubs, at parties and weddings for two hours of high energy boot-stomping fun. 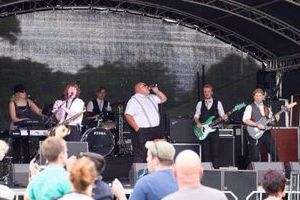 Fiveska was formed in early 2010 by five local musicians, and after many changes over the last 8 years and over 500 gigs we are now a six piece band working a tighter set for even more Ska fun! We perform in the Cambridgeshire area and beyond in pubs, clubs, at weddings and parties, and we love what we do!